A lower-calorie version of a favorite! An ice cream sandwich cake with lower sugar and fat ingredients, but all the great taste remains! The very first dessert I made the husband after we were married was an ice cream sandwich cake. We had just gotten back from our honeymoon and still had about a week until school started up. The particular day I made these, the husband had left for work and I had the day off. I worked on unpacking our new apartment most of the day, but in between the boredom of unpacking box after box, I kept myself entertained with making this very dessert. You may think it’s weird that I remember this four years later, but I guess it also just goes to show how impressive this dessert is. I mean it’s that good that I still remember it all this time later. And, admittedly, I’m a bit of a dessert freak — I always remember and subsequently crave my favorite desserts. 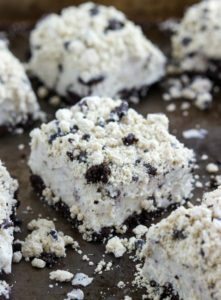 They base is actually made with Weight Watchers ice cream bars which are quite a bit lower in calorie and fat content that regular ice cream sandwiches. 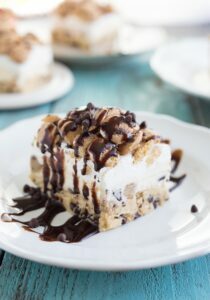 The other way this dessert is majorly lightened-up is by using fat-free frozen whipped topping. To top the dessert off, I crushed a few cookies on top which you could do OR you could crush up a candy bar (Heath, Skor, or Butterfinger recommended) for the top of this cake. With only a few ingredients and about 15 minutes to make this creamy and delicious cake, it’s so worth it to try it out! One other thing to note, I believe this cake is best made about an hour or so before it will be served. First off, it needs to harden up a bit before it cuts well (like 25-30 minutes). Second, if it sits in the freezer longer than a few hours or overnight, the whipped topping tends to get a little bit icy. It still tastes great, but is best served pretty soon after making. Unwrap the ice cream sandwiches. Press 5 sandwiches into the bottom. Cut up the sixth one (There are 6 in each box) and fit it in the blank space. With a spatula, spread half of the whipped topping over the ice cream sandwiches. Drizzle the chocolate syrup over the whipped topping. Then drizzle the caramel syrup over that. Repeat the steps -- top the caramel syrup with 5 more of the bars, fitting the sixth in the empty space. Spread the rest of the whipped topping over the bars. Drizzle the chocolate and then the caramel syrup on top. Crush the cookies or candy bar and sprinkle on top. Cover tightly (be careful the tin foil or plastic wrap doesn't touch the top layer or it will stick) and freeze for 20-30 minutes or until solid. Immediately return any leftovers to the freezer. *Try a crushed up candy bar (heath, skor, butterfinger) instead of the cookies if desired. **I like to make this cake the same day it will be served -- the whipped topping tends to get a bit icy after the first day. This ice cream cake looks irresistible! This looks like such a delicious summer time treat! Sometimes you need an effortless dessert and this one is just that without sacrificing the wow factor! I totally want a bite of a dessert that you can remember 4 years later! 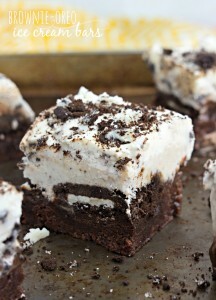 Ice cream sandwiches and cake in the same sentence sounds like something I need to sign up for! Pinning! I would definitely remember this cake, too! It looks amazing, Chelsea! Love that it’s lightened up, so perfect for the summer! Pinned! That looks so good Chelsea! I actually really enjoy Weight Watchers ice creams because they aren’t filled with junk or artificial stuff! This cake looks super delicious and easy to make!! This looks so delicious, Chelsea! I can’t believe it’s lightened up (but love that it actually is)!! Just delicious! This is calling my name! I love the back story to the ice cream cake. This looks delicious and is perfect for the upcoming Summer. This sounds like a delicious summer treat! This ice cream sandwich cake is just so irresistible. It looks so good and it’s very satisfying. It’s good that you haven’t forgotten about it. Thanks for sharing this! This cake looks incredible, Chelsea! Ice cream is my favorite all time treat so I would definitely remember this cake after all those years! Love that it’s lightened up too! Winning moments in my life? Managing to take a shower in the mornings before my baby wakes up and getting more that 3 hours of uninterrupted sleep at night 😉 I definitely need to celebrate with this awesome ice cream sandwich cake! Love that it’s on the lighter side – so good for summer! This cake looks amazing! 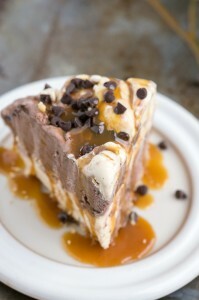 I make an ice cream cake too but with a lot more fat!! Loving your version so much more! OH. MY. GOODNESS!!! That looks AMAZING. Definitely need to give this a try with the Weight Watchers Ice cream! OMIGOSH! Such a simple idea and ooooh it looks so so tasty!